CRISPR is the sensational molecule of interest, and there is hardly anyone in the biology world who havent atleast heard about them. CRISPR as a tool has seen very rapid development in the last couple of years and the CRISPR patent war is one of the most followed news in Genetic engineering technlogy. Who would know that a simple curiosity driven sceince of what does a repeating set of sequences mean in a bacterial genome revolutionise the whole biotech industry. I have long back written about the basics of CRISPR and readers are referred to my earlier post for basic details. CRISPR is not a fool proof technology. A study published sometime ago on genetic editing in a human embryo model (Link) showed that there were mutliple off target hits. It is also evident that he technique is not a 100% success. There have been several attempts to improve this situation by making more specific enzymes. During the search several alternatives have been proposed such as a smaller cas9 found from S aureus (Link) and Cpf1 (Link). Cpf1 is currently a highly pursued enzyme, thanks to a better and more fine tuned activity. Another enzyme called C2c2 is a RNA-guided RNA-targeting CRISPR effector unlike others which are preferentially active against DNA (though type III systems can also target RNA). The most recent paper by Burstein et al;2016 shows that there is an untapped long list of CRISPR system in non cultivated environmental organisms such as archaea, currently assigned a nomenclature as CasX and CasY. So here is a key question. Considering that CRISPR cas system is not absolute and there is a good possibility that there is a targetable sequence somewhere in the host genome, how does tha bacteria protect itself from its own DNA attack system. Given that CRISPR cas system is an evolutionary old phenomenon, havent the phages developed any anti CRISPRs? Two back to back papers are being published in cell that looks into these question and find that there are indeed naturally occurring CRISPR blockers. Fig 1: Anti CRISPR (Acr) gene neutralising the Cas9. From reading the paper, I understand that anti-CRISPR protein is not a totally new finding or a new concept (I didnt know this!!). For example, Davidson etal;2013 had discovered 5 phage encoded proteins in bacteriophages infecting Pseudomonas aeruginosa, that was able to neutralise the activity of I-F CRISPR systems. Their subsequent studies identified another 9 phage proteins inhibiting both type I-F and I-E CRISPR systems. In the latest paper by the same group, three distinct families of anti-CRISPRs that specifically inhibit the CRISPR-Cas9 system of Neisseria meningitidis has been reported. In another paper by Rauch etal, the team bioinformatically screened 275 genomes of Listeria monocytogenes and identified type II-A CRISPR-Cas9 systems in 15% of them. What was striking is they found 3% of genome with self targeting sequences. Further studies showed that 4 of the proteins were capable of blocking the activity of the Listeria Cas9 protein. Of these 2 proteins- AcrIIA2 and AcrIIA4 was also able to block Spycas9 (cas9 derived from Streptococcus pyogenes), which is the most commonly studied and used Cas9. As Rauch comments in a press release, "Just as CRISPR technology was developed from the natural anti-viral defense systems in bacteria, we can also take advantage of the anti-CRISPR proteins that viruses have sculpted to get around those bacterial defenses. The next step is to show in human cells that using these inhibitors can actually improve the precision of gene editing by reducing off-target effects. We also want to understand exactly how the inhibitor proteins block Cas9's gene targeting abilities, and continue the search for more and better CRISPR inhibitors in other bacteria." Pawluk A, Amrani N, Zhang Y, Garcia B, Hidalgo-Reyes Y, Lee J et al. Naturally Occurring Off-Switches for CRISPR-Cas9. Cell. 2016;167(7):1829-1838.e9. Rauch B, Silvis M, Hultquist J, Waters C, McGregor M, Krogan N et al. Inhibition of CRISPR-Cas9 with Bacteriophage Proteins. Cell. 2017;168(1-2):150-158.e10. Bondy-Denomy J, Pawluk A, Maxwell K, Davidson A. Bacteriophage genes that inactivate the CRISPR/Cas bacterial immune system. Nature. 2012;493(7432):429-432. 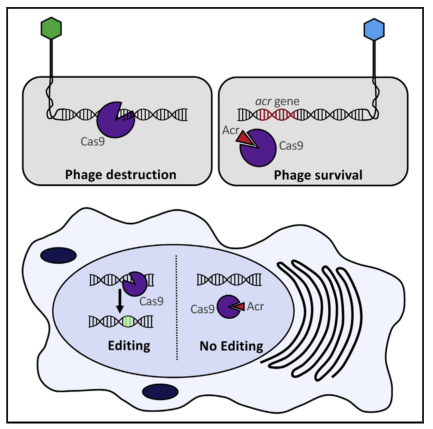 Maxwell K. Phages Fight Back: Inactivation of the CRISPR-Cas Bacterial Immune System by Anti-CRISPR Proteins. PLOS Pathogens. 2016;12(1):e1005282.